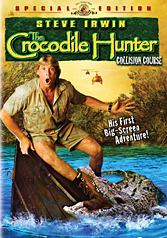 On MGM Home Entertainment's release of Steve Irwin's big-screen debut, 'Crocodile Hunter: Collision Course' you can find an additional clip hidden on the disc.Boot up the DVD and once you get to the disc's "Main Menu", press your Left button. This will highlight the left-most video feed at the bottom of the screen. Now press your Enter button and you will be treated to an interview clip with the movie's camera man, as he talks about the experience of bringing the Crocodile Hunter from the small screen to the cinemas. From the main menu go to the "Special Features" and press the 'Up 'arrow key on your remote control. This will highlight the word 'Features' on the screen and if you press your Enter button now, you will see a brief interview with the movie's costume designer. Go to 'Scenes 9-12' and on that screen highlight scene 9. Now press your Up button and you will get to see a clip about the movie's stunts.